If your kitchen knives are dull, you are not alone. If you do not sharpen your knives regularly, even on high-end cutlery, you most likely have dull knives. To solve your dull knife problem, we recommend using diamond stones for sharpening your kitchen knives. There are two methods for sharpening your kitchen cutlery using diamond stones. The first method is to use sharpening stones. This is the traditional method that has been used for many years. Stones are versatile and can also useful for sharpening other items around the house or shop like garden tools or woodworking tools. The second method is to use an electric knife sharpener. The high-quality Chef's Choice Knife Sharpeners use 100% diamond-coated disks to put a razor-sharp edge on just about any knife quickly and easily. 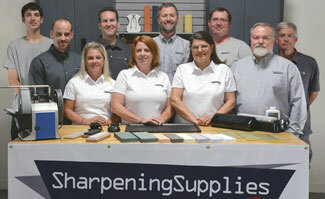 (Click here to learn more about Chef’s Choice Sharpeners.) For the purpose of this article, we will explain more about sharpening cutlery using diamond stones. The DMT® diamond stones we carry use high quality monocrystalline diamonds. The monocrystalline diamonds are less prone to fracture and are very consistently sized. This means that you can produce a fine edger faster and the stone will last a very long time. Diamond stones use water to wash away the metal filing (called swarf) created during sharpening. This makes it very convenient since water is very abundant in any kitchen. Every few minutes apply some more water to the surface to keep it wet. If you are an experienced knife sharpener and like to sharpen your knives freehand, we recommend the DMT® 8" Duosharp® stone coarse/fine combination with the bench stone holder. For the experienced sharpener, the 8" stone provides plenty of room to sharpen most kitchen knives and the stone holder holds the stone above the counter to provide plenty of clearance for your hands. Of course, if you really want the ultimate in sharpening, the 10" Duosharp® stone is even better; but unless you have larger knives, the extra size really just a nice luxury. If you do not feel comfortable using a bench stone yet, we recommend the easy to use knife sharpening guide. When combined with the double sided coarse/fine 8" DMT® Duosharp® stone, it will create a long lasting sharp edge. Click here for a complete step-by-step guide showing you how to sharpen your kitchen knives using a bench stone. 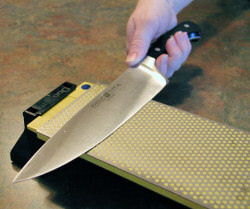 Questions about sharpening your kitchen knives?